This motor is not as electrically noisy as the FA-130 motor used in many of the Tamiya gearboxes, and it draws much less current. The two motors are the same size and have similar output power, but, with double the voltage and half the current, these units are generally more convenient to use. If you would like to use lower-current motor controllers with the Tamiya gearboxes, you can simply replace the original Tamiya motor with this and you’ll be set! (Tamiya gearboxes that work with this motor include the popular 70168 Double Gearbox and 70097 Twin-Motor Gearbox.) These motors can also be used to replace those found in the Solarbotics GM2, GM3, GM8, and GM9 gearboxes. The Brushed DC Motor 6V, 11500rpm has a recommended operation voltage of 3 – 12 V. Approximate specifications at 6 V: free-run speed of 11,500 RPM, free-run current of 70 mA, and stall current of 800 mA. 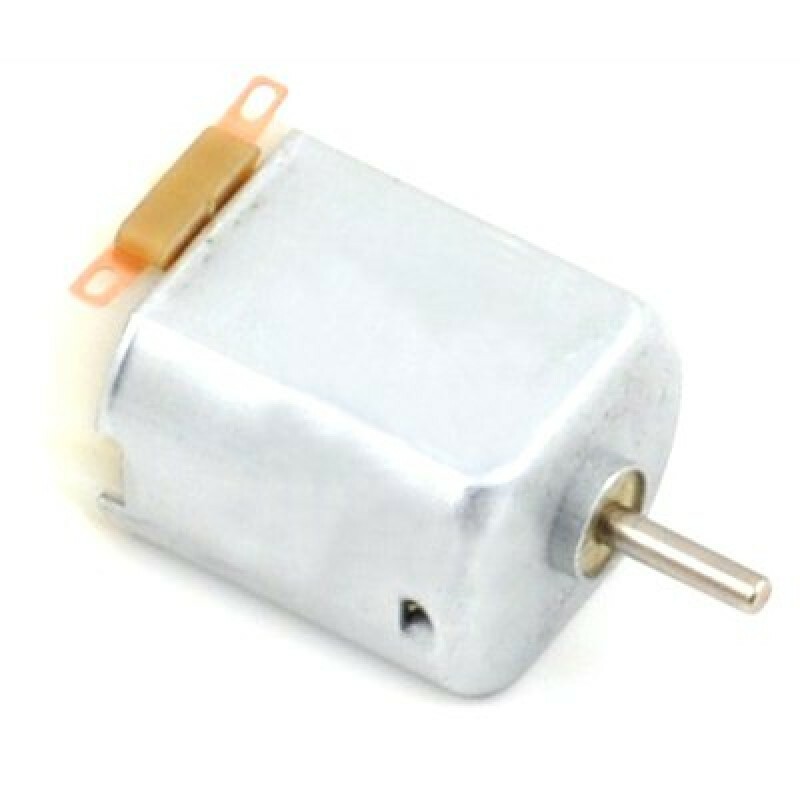 This 130-size brushed DC motor has a recommended operation voltage of 3 – 12 V and is used in the larger Pololu plastic gearmotors. It has a recommended operating voltage of 3 – 12 V; at 6 V, the no-load speed is about 11,500 RPM, the no-load current is approximately 70 mA, and the stall current is around 800 mA. For an estimate of the torque, note that the Pololu 228:1 plastic gearmotor produces roughly 100 oz-in of torque at 6 V using this motor, and the Pololu 120:1 plastic gearmotors produce roughly 75 oz-in of torque at 6 V. The output shaft has a diameter of 2 mm.